Our Reception/Front Office is open from Monday – Saturday 8:30 am – 5:00 pm and Sundays from 9.00 am – 1.00 pm. However we will also be here to greet you for flights that arrive outside of those hours provided you have given us your accurate flight information so that we know when to expect you. The property is less than 8 km/5M north of the airport and about 3 km/2M north of the capital town of Kralendijk. Walking to town is enjoyable along the paved waterfront walk that begins just south of us, and takes less than 15 minutes. Check In time is 2:00 PM; check out time 11:00 AM. If you wish a late check out please contact our Reservation Department for availability and fees. In addition to the 15 apartments (3 island view and 1 ocean view studio, 5 one-bedrooms, 2 ocean view two bedrooms and 3 ocean front 2 bedrooms and 1 Deluxe 2-bedroom) there is the Bonaire Dive & Adventure Dive shop and dock on property as well as Breezes N’ Bites serving breakfast from 7:30 am- 10:00 am seven days a week. Closed for lunch and dinner on Wednesdays (breakfast only with a pre-paid package). Lunch is served Thursday – Sunday from 11:00 am to 3:00 pm and dinner Thursday – Tuesday from 6:00 – 9:00 pm (the bar remains open between lunch and dinner.). Bonaire’s delicate environment benefits greatly when linens and towels aren’t cleaned every day. As such, Den Laman has adopted an “every other day” housekeeping policy. Your apartment has a safety deposit box, and LCD TV with Surround Sound System (plays music CD and DVD’s.) There are direct dial phones in all of the apartments to call the reception desk and other apartments within the complex. For all other calls a pre-paid phone card can be purchased at the local telephone company TELBO. Free wireless connection is available in all units. A secure wireless connection is available for a fee of $2.50 per day / $15.00 per 7 days and more. Your kitchen is fully equipped with a full size refrigerator, microwave, dishwasher, stove, coffee maker, toaster and complete cooking supplies and utensils. You also have a dining table with seating for four in the studios and one bedrooms and seating for 6 in the two bedrooms. A reminder that condos are self-catering. If guests do not plan on grocery shopping when they arrive, they might want to consider bringing a “starter kit” of whatever they need to get them through the first morning before heading out for breakfast or the store. This might include such items as coffee, tea, sugar and creamer. Your kitchen can be pre-stocked with a limited supply of grocery essentials so long as we have 48 hours notice. A $25.00 service charge will be applied to all orders. We’ll provide you with shampoo, body soap and hair dryer. 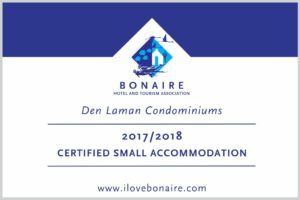 Linens and towels are provided with the exception of wash cloths/face cloths which are not customarily on Bonaire. FREE wireless internet access is available. We offer a secure internet connection for $2.50 per day or $15.00 for 7 days and more. Dive Registration, Orientation & Marine Park Fee: Dive Friends Bonaire, which is located on property, opens at 8:30 am. Divers must register at the dive center, and bring their (1) dive certification card, (2) diving vouchers, (3) credit card for a security deposit, and (4) US$45 cash for the required purchase of a Bonaire Marine Park Tag. The Bonaire Marine Park requires all visiting divers to participate in a short orientation session on their first morning of diving. At Dive Friends Bonaire, this orientation is held at any time during our opening hours. After the orientation, divers must do a self-guided familiarization dive on Bari Reef in front of the Resort before leaving for off property shore diving or boat diving. The purpose of the dive is to recheck buoyancy and to check your dive equipment while still within safe distance of the dive staff and facilities. When you can begin utilizing your dive package depends on when you arrive on island and have had time to complete your dive orientation. Once you have completed the orientation session it is up to you to decide if you would like your diving day to begin that day, or if you would like to rest up and begin with your orientation dive on Bari Reef another day. In all cases, the use of your dive package beings the day you take that first tank for the orientation dive. In the vast majority of cases, divers arriving on afternoon flights attend orientation at 9:00 a.m. the following morning. The boats leave the dive dock at 9:00 a.m for two-tank dives, returning at approximately 1:00 pm. Boats then leave at 2:00 pm for a one-tank afternoon boat dive assuming we have a minimum of 6 divers. All divers are asked to please be ready and on the dock at least 10 minutes prior to departure. Gear storage is available free of charge in dive shop. Booties and open heel fins are necessary for off property shore diving along the iron coast. Full foot fins are adequate for boat diving & diving on property. Dive Friends Bonaire offers Den Laman guests Nitrox upgrades for only $20 per week with any prepaid dive package, provided of course you are a certified Nitrox Diver. Nitrox tanks are available on our dock, and also at the drive up air/Nitrox fill station, which is located adjacent to our parking lot. Dive Friends Bonaire also offers Nitrox course if you are interested in becoming a Certified Enrich Air Diver. Whether you choose or need to wear a wet suit is a personal decision that needs to be based on your You can expect the water to reach the high 70’s in the winter and the mid to low 80’s in the summer. Most people will find that they are comfortable in a 3mm full to 2mm shortie, depending own your own “internal thermometer. Others might be perfectly happy in skins! Dive Friends rents 2 mm shorties as well as full 3mm wet suits. All non-divers who use the waters of the Bonaire Marine Park including snorkelers, wind surfers, kayakers, sport fishermen, kite boarders, etc., will be charged a Nature Fee of $25.00 per year. All persons who pay the Nature Fee (both divers and other users) and show their tag along with their printed receipt will receive complimentary admission to Washington-Slagbaai National Park throughout the year their tag is valid. Whether your preference is boat or shore diving, kayaking, mountain biking, bird watching, cave exploration or snorkeling, our programs offer visitors the opportunity and mean to explore the highlights of our island’s multifaceted natural treasures. Bonaire is located just off the coast of Venezuela in the southern Caribbean, part of the Dutch Antilles island chain that includes the more developed Aruba and Curacao. We are please to be well outside the hurricane belt. Latitude/longitude (GPS): 12°10′ N 68°17′ W.
Bonaire is a small (111 square mile) island, only 3 to 7 miles wide and approximately 24 miles long. With the exception of Mount Branderis and the north western areas near Washington Slagbaai National Park, the island is primarily flat. It is also quite arid, averaging only slightly more than 20 inches of rainfall annually, most of which falls autumn through January. Easterly trade winds wash over the island year round, helping to dissipate the heat, with average land/air temperatures ranging in the low 80’s Fahrenheit. There are several different options for getting to Den Laman on international carriers from North and South America as well as Europe, however flights change regularly. For the most up to date information please visit http://www.tourismbonaire.com. Ferry service is not available between Bonaire and Aruba, Curacao or Venezuela. All visitors to Bonaire are required to have a valid passport. No Visas are required for U.S. and Canadian citizens. It is the customer’s responsibility to ensure his or her own visa requirements, and no refunds will be awarded for customers denied access for lack of proper Visa. Airline tickets generally include the airport departure tax of $35.00. If not, the departure fee will be payable in cash or debit/credit card at the airport prior to check-in. Children under 2 are exempt from the tax. MasterCard, Visa, Discover, Maestro, are all accepted, but American Express is not. Departure tax to Curacao and Aruba is lower. Children 12 and under are exempt from paying government room tax. Please be sure you have notified us if you will be traveling with an infant and need a crib reserved for a one time $20.00 fee. If you have reserved a rental vehicle with your package, the majority of the rental agencies are located in a building just outside the airport terminal. You will need to present them with your Rental Car voucher upon arrival. Vehicle Insurance, which ranges from $11.00 – $25.00 per day depending on the rental agency, is highly recommended for all drivers. Most credit card companies, auto and home owner insurance policies exclude coverage on truck rentals.Â (See reference above to drivers ages 23 – 25.) Insurance deductibles range from no deductible to $1750.00 depending on the rental agency, the type of insurance coverage selected, the type of vehicle rented and if the driver is under 25. Be sure to familiarize yourself with the fine print of your contract and insurance program. Vehicle insurance is purchased directly with the rental agency when you pick up your vehicle. You should also be aware that most rental agencies will post a security deposit/authorization charge to your credit card to cover any vehicle insurance deductible at the time of rental. We encourage all visitors to Bonaire to rent a truck to explore the island, and for that reason have included one, at very competitive rates, in all of our packages. They are great for touring, getting you to your shore dive sites and taking you around town to sample the local cuisine. You do not need to obtain a local drivers license or permit to be able to drive on Bonaire, though you do need to be at least 23 years of age to rent a vehicle. Bonaire operates on Atlantic Standard Time, but not daylight savings (no summer time change). Bonaire’s official currency is the US dollar. Traveler’s checks and credit cards are widely accepted but be sure to have your passport or photo ID available. There is a bank with a 24-hour ATM within walking distance. There is a small convenience store within walking distance, excellent wine and liquor store across the street, and larger grocery stores are within a 5-minute drive. Ask our staff at the front desk for recommendations on where to shop, as the stores most easily found are not always the ones with the best selection for foreign visitors. But our local staff stands ready to point you in the right direction! Your kitchen can also be pre-stocked with a limited supply of grocery essentials with 48 hours notice. A $25.00 service charge will be applied to all orders. Bonaire has a fringing reef and iron shore leaving few areas for natural beaches. We do have a small “beachette” in front of the property. You can also can enter the water for swimming or snorkeling via the ladder on the dive dock, where you enter into no more than 3 feet of water. There is also a man made beach adjacent to the resort that is accessible from Den Laman, and two lovely combination coral/sand beaches (Pink Beach and Windsock Beach) heading south, as well as a smooth sand area great for small children out at the protected lagoon of Lac Bay. Bonaire has a hospital no more than 10 minutes away from the Resort and an adjacent hyperbaric recompression chamber that is run by highly trained staff, admittance via the emergency room at the hospital.